Please find the revised plans for Kings Stables Road, now with added nightclub being made into student accommodation in the plans below. Subject to planning permission, the proposed redevelopment of the site on King’s Stables Road will be taken forward by a joint venture between Peveril Securities – the development arm of the Bowmer and Kirkland Group (B&K) – and Campus Development Management, who have it under option from the Council. 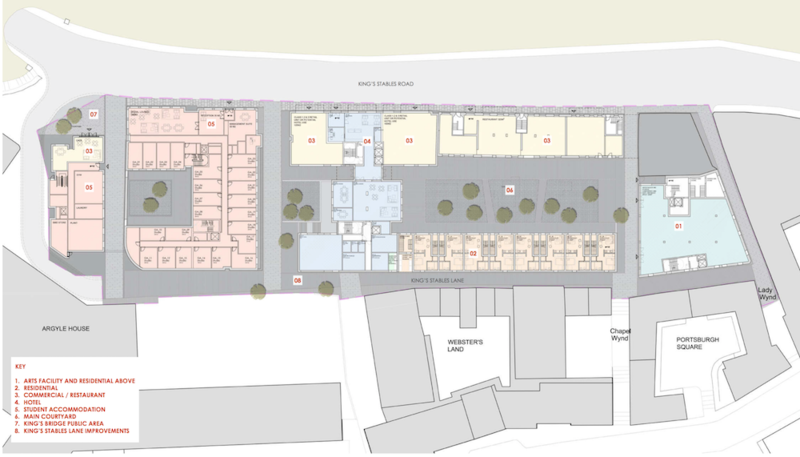 A major mixed-use development on the site is proposed and will involve new build, alteration and partial demolition of existing buildings, subject to planning approval. The development, with its arts café complex and artisan workshops, will bring a vibrant mix of uses to the area and complement the Council’s aspirations for a new cultural quarter on the site of Argyle House, as well as linking Castle Terrace with the Grassmarket and West Port. Yet another hotel!!! And a few token flats, as a gesture of course to allow the builders to get permission for the 110 room hotel, and 245 wee rooms for students! Fed up with bloody hotels!